St Nicholas Church is a friendly, welcoming church in the centre of the delightful village of Linton having spectacular views over the weald of Kent. A haven of peace and beauty if you take time to stop on your journey along the A229. We are a small fellowship worshipping in fairly traditional form and caring for each other as well as reaching out to the village and surrounding neighbourhood. Services are held every Sunday, Holy Communion from Common Worship at 9.30am on the 2nd Sunday; at 8am on the 3rd Sunday from the Book of Common Prayer (1662); and a service for the whole family at 9.30am on the 1st Sunday. There is an informal mid week celebration of the Holy Communion on the last Wednesday of each month at 12 noon. This is often followed by a light lunch of soup and a roll at which all are welcome. 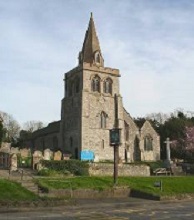 We welcome applications for Baptism and Marriages from people living in the village and such services can take place in St Nicholas or any of the other four churches in the group, namely: The Parish Church of East Farleigh; St Mary’s, Hunton; Holy Trinity Coxheath and All Saints, West Farleigh. The clergy are available to take funerals at any of our churches or at the crematorium at Vinters Park, Maidstone. The clergy are also available for consultation, home visits or to give Holy Communion to the house bound at all times. The church has connections with Linton Place and historically with the Cornwallis family and there are some very fine monuments in the church, particularly in the Cornwallis Chapel, some by E H Baily (sculptor of Nelson in Trafalgar Square). We have a NADFAS Church Trail for children up to 12 years. Rather like some of the National Trust site questionnaires for children, though more intense, church trails identify special characteristics in the church for children of up to 12 to follow, search and check against the ultimately revealed answers. We consider that the trail is of interest to all ages, though! Families, school and Church groups as well as individuals are welcome. Fourth Sunday 9.30 am Morning Prayer Traditional Morning Prayer service with choir and hymns.